For this Iron Craft challenge, we were to make something for the theme of cozy. In my mind, nothing is cozier than a big bulky knit. 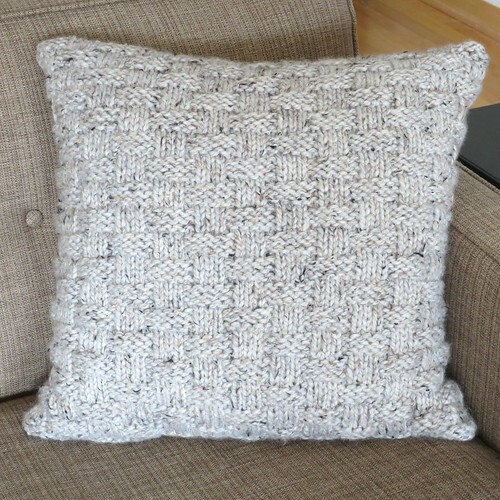 I’ve been seeing all these lovely, textural knit throw pillows in stores lately and I love them, but as a knitter, I can’t bring myself to buy one already made. This challenge gave me the perfect opportunity to whip one up. I love how mine turned out. It was an easy knit and I did it so there were only two edges to seam up. It is big, soft and perfect for cozying up with in front of the fire. *Update 11/27 This pattern was accidentally written to work flat instead of in the round, as it was meant to be. It has now been fixed and should be worked in the round. 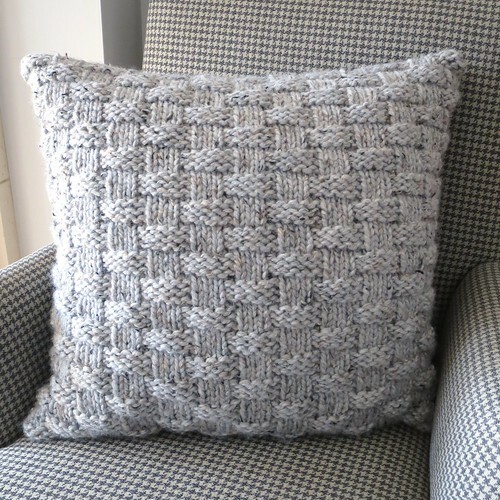 Download a pdf of the Knit Basket Weave Pillow Pattern. These instructions are written for use with a 20″ x 20″ pillow insert, but you can adapt them to fit any size you want. The stitch pattern requires a multiple of 8 plus 3 stitches. I like to make my pillow cover about 1 1/2″ – 2″ shorter in both directions than the insert because the knitting stretches and I like a well-stuffed pillow. So, say I wanted to make a cover for an 18″ x 18″ pillow insert. That would mean I wanted it to be 16″ wide. I would take 16 and multiply it by 2.75, which equals out to 44 stitches. In order to make it work with the pattern, I would only use 43 stitches, 8 x 5 = 40 +3. So, I would cast on 86 stitches, 43 for the front of the pillow and 43 for the back. Cast on 102 stitches. Place a stitch marker between the first and last stitch to mark rows. You will be knitting in the round. Row 5: k51, k3, *p5, k3, rep from * until end of row. Row 6: k51, k3, *p5, k3, rep from * until end of row. Repeat rows 1 – 8 until pillow measures 18″or desired length. The pillow will look neatest if you end on either row 3 or 7 of the pattern. You may want to slide your insert into the knit cover to make sure you like the fit. Divide the stitches so that the first 51 knit stitches are on one needle and the remaining patterned stitches are on another (or two sides of your circular needles). Seam shut with kitchener stitch. 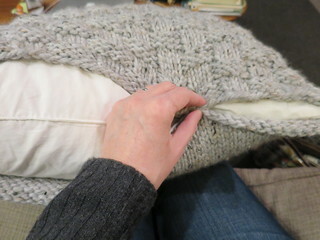 (Kitchener stitch finished the edge of the pillow seamlessly, but if you prefer you can bind off and seam the end shut.) Weave in any ends. Slide in the pillow insert. You can see mine fit quite tightly. There was enough of the cover to fit it easily when I pulled it together, but it was not baggy at all. Seam the bottom edge shut. Do not duplicate for distribution, repost, sell or teach without permission. 4 years ago by Kat in Challenges , Iron Craft , Knitting , Knitting Projects , Needlecraft , Projects | You can follow any responses to this entry through the RSS feed. You can leave a response, or trackback from your own site. You need to MULTIPLY the width by 2.75, not divide it. In fact, that is what you did (16 x 2.75 is 44) but it would be confusing for someone else trying to work out a different size! I love the pillow, though. So cosy! Oh my gosh, good catch Ros! My head has been a little distracted these days. Any way to fix directions on this page or mention they are incrrect at top of page so one doesn’t start patternthen realize its incorrect.. PDF looks wrong too. This pattern didn’t look right, found correct pattern on another site. 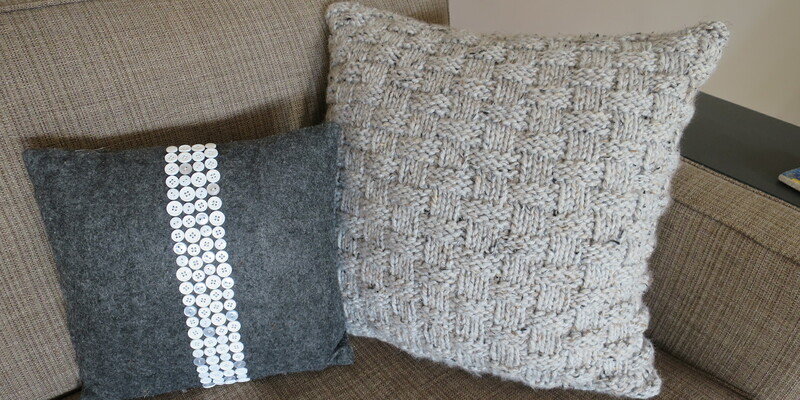 The pattern and the PDF are correct for a 20″ x 20″ pillow as stated. The only part Ros was saying was wrong was how to adapted the pattern for a different size pillow where I accidentally wrote divide instead of multiply and that has been fixed. Is there something else you are finding wrong with the pattern? If I use a Provisional Cast On I can close both ends with the Kitchener stitch. You totally can do that! To knit it flat, just make each section separately then sew them together (or do 1 long piece that has the back followed by the front, therefore only requiring the sides & top/bottom to be sewn up). So if you were to make the one in the pattern, you’d cast on 51 stitches & work in stocking stitch (knit 1 row, purl 1 row, until you reach your desired length (in the round you only need to knit as there is no wrong side to your work). Then you would make the basketweave side, so either continuing from the back or cast off/bind off, then work the front separately. If making separately, cast on 51 for the front & follow the instructions as per the pattern above, but ignore the k51 for each row. I am working on a project where I am teaching myself a new pattern with 1 skein of Lion Brand 5 oz weight per block yarn. I am casting on 40 stitches for each skein/block. My goal will be to stitch (somehow) together all the blocks completed into an throw, say 4 blocks by 4 blocks. I would like to try the basket weave pattern next. I am using #13 needles. If I read your post correctly, I would cast on 40 + 3 stitches to being the basket weave pattern. Is that correct? I really just want a block front to add to the other 2 blocks/different patterns I have already completed. Hope this makes sense. Thanks so much. Love the pillow! Also what thickness is the needle in inches if size 11 ( is that size 11 US)? Drea, I believe that it is US size 11, so that would be 8mm needles (metric) or size 0 for Canada or UK (most work in mm in UK). I’ve never heard of anyone stating needle sizes in inches! I have found some yarn that I think I may like to make the pillow from, but they ask for 9mm needles (Stylecraft Nordic Super Chunky), if that helps! It is all about your gauge. Knit up a swatch with your yarn and the needles you want to use. Measure it and count how many stitches are in an inch. Now you need the pillow to be about 30 inches around (That will make a nice tight cover for a 16″ pillow.) So, multiply 30 by the number of stitches per inch and that will give you the number you need to cast on. Keep in mind that the pattern for the front of the pillow requires you use a number of stitches that is divisible by 8 plus 3 stitches, so you may need to tweak the actual number of stitches you use by a few. Then just knit until the pillow is 15″ long. If I am making the pillow in a smaller size, casting on 86 instead of 102 stitches, Where do I shrink the pattern on the knit /pearl side? I am ended up with the 5 pearl and then the last 4 are supposed to be pearl?? You are changing how many stitches are on each side of the pillow, so row 1 -3 will look like this K43, p4, k3, p5, k3, p5, k3, p5, k3, p5, k3, p4. Basically what you are shrinking is the number of times you do the (p5, k3). In the 102 stitch version you would do that 2 more times. So then Row 5 – 7 will be k43, k3, p5, k3, p5, k3, p5, k3, p5, k3, p5, k3. Désolé , nous ne disposons pas la capacité de faire des traductions .